Russian has sent several military advisers to Libya to assist forces loyal to Gen. Khalifa Haftar. “The Russian support is conducted through UAE and Egyptian mediation assistance,” the London-based New Arab newspaper reported last week. “There are tens of them (Russian advisers) and they are specialized in different war-related fields,” a source told the New Arab. The source said that the Russian contingent aims to help re-assemble Haftar’s forces, renew the weapons systems they have, and overhaul their air and naval defense systems. 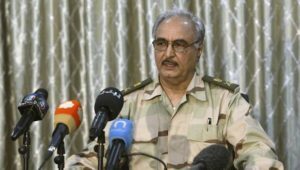 “The whole air force system used by Haftar’s forces was overhauled by the Russian experts,” the report said. The sources said several meetings between the Tobruk-based government that Haftar supports and Russian officials have been taken place in Cairo this year. Meanwhile, forces loyal to Libya’s UN-backed Government of National Accord (GNA) are struggling to drive Islamic State of Iraq and Levant (ISIL) out of its stronghold in Sirte. GNA forces, who launched the assault in May, have recaptured large chunks of the coastal city but have failed to dislodge several pockets of ISIL resistance. “The final assault is being held up… mainly due to the fact that it will result in very intense street fighting and Daesh (ISIL) is determined to defend its positions right down to the last square meter,” Rida Issa, spokesman for the pro-GNA forces, told AFP. On Nov. 9, the U.S. announced a resumption of anti-ISIL airstrikes in Sirte following a one-week break. With the jihadists contained in an area of less than one square kilometer (less than half a square mile), “it is unclear what the impact of (further) airstrikes would be”, said Mattia Toaldo, a Libya analyst with the European Council on Foreign Relations. The GNA’s battle to liberate Sirte has “taken longer than expected for a number of reasons: first they have encountered more resistance than expected… they suffered more casualties and eventually started to feel war fatigue,” he said.